It’s sweet. It’s colorful. It’s luscious and juicy. And on top of all that, it’s good for you. Fruit, beautiful fruit—so delicious eaten by itself, and so very complementary to a surprising number of savory meats and cheeses. We’ve paired DI LUSSO® meats and cheeses with fruit in these six featured recipes. Three lovely recipes just right as appetizers, snacks, or party foods, all feature fruit in surprising ways. 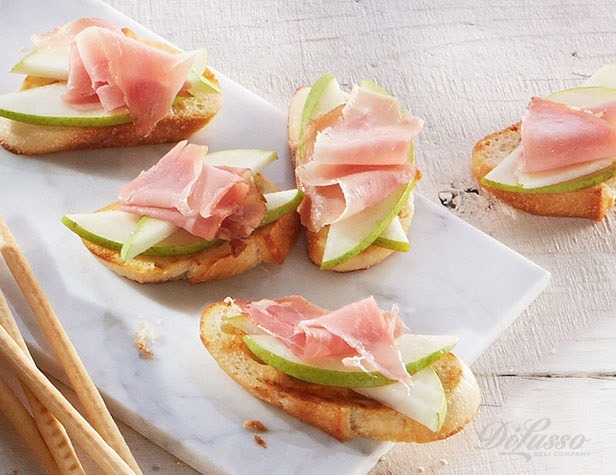 Prosciutto Pear Crostini are made up of just three ingredients, because sometimes less is more. And in this case, the sweet juicy pear, with the saltier notes of the prosciutto, makes for an understatedly elegant offering. 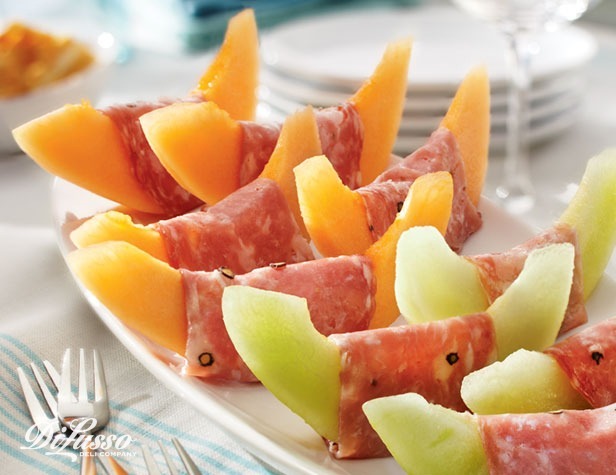 Sopressata Wrapped Melon is just right for summer when melons are at their peak. This couldn’t be simpler or prettier to look at. 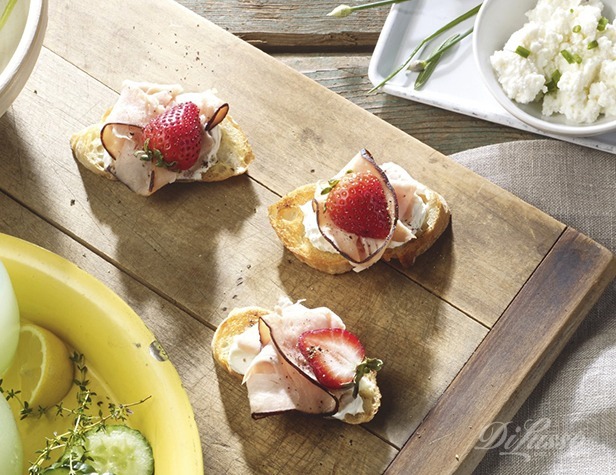 And our Balsamic Strawberry Turkey Crostini marries the complex sweet-sour qualities of balsamic vinegar with the sweet tartness of strawberries and the savory, slightly sweet flavor of DI LUSSO® Maple Turkey, tempered with rich cream cheese. Fruit is a natural in salads, the perfect counterpoint to crisp greens and other ingredients. 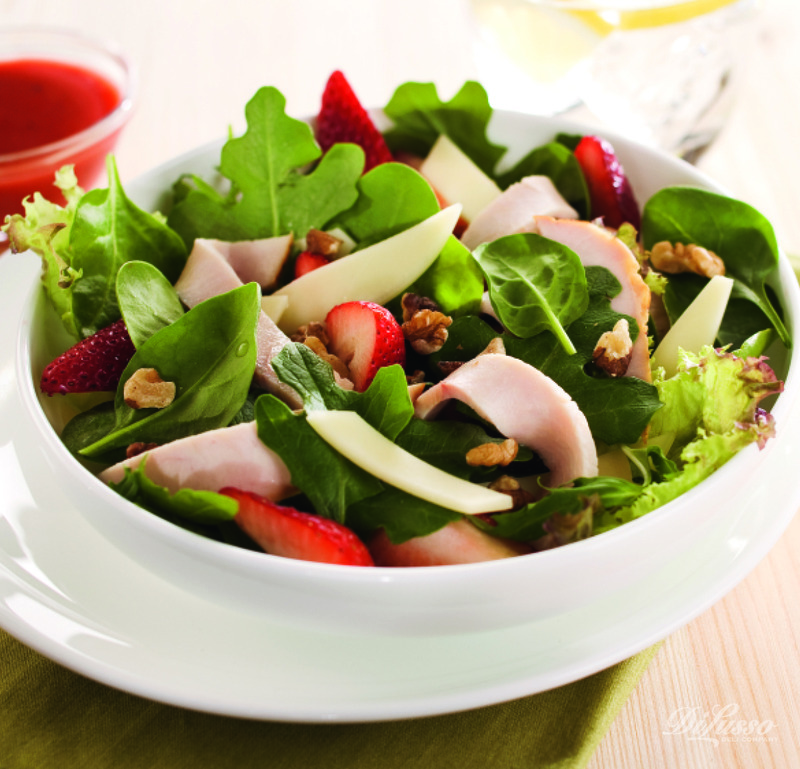 Our Turkey Strawberry Salad is another wonderful strawberry-turkey pairing that also includes DI LUSSO® Honey Turkey and Provolone cheese, walnuts, and a fresh-tasting strawberry vinaigrette. 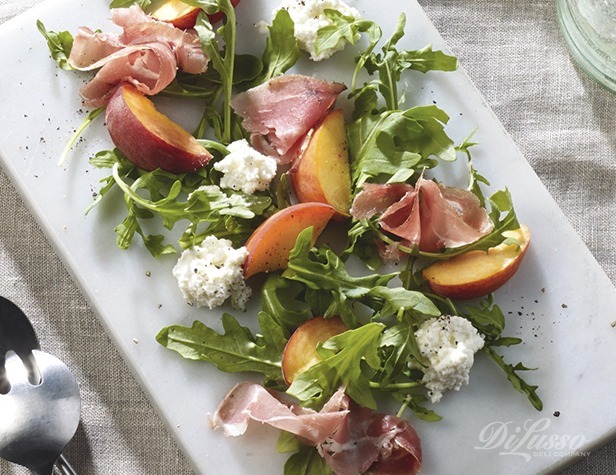 Peaches are exquisite in summer, and our Prosciutto Peach Salad is another ingenious fruit/prosciutto combo that’s topped with lively goat cheese. Fruit in a wrap? Why not? 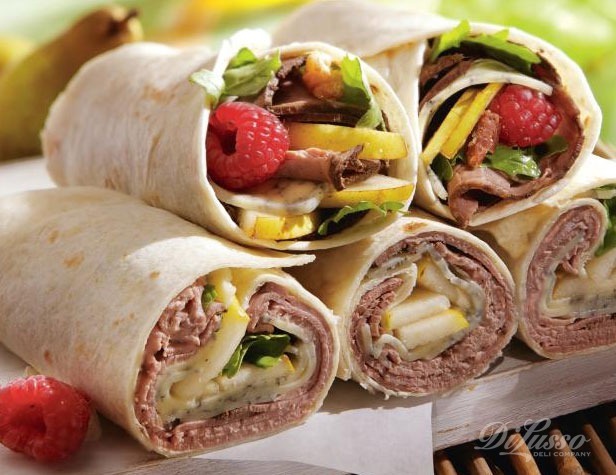 DI LUSSO® Seasoned Roast Beef, Monterey Blue Cheese, candied pecans, fresh ripe raspberries, and balsamic vinaigrette, rolled tightly in a tortilla, makes our Monterey Blue and Roast Beef Wrap a must-try. Reward yourself for the fruits of your labor with one of these recipes (or all of them!) at the end of a busy day. They’re simple to make!